(Left) HH the Amir Sheikh Sabah Al-Ahmad Al-Jaber Al-Sabah receives Saudi Foreign Minister Adel Al-Jubeir yesterday. KUWAIT: The foreign ministers of Kuwait and Saudi Arabia have signed a deal to establish a “coordination council” as a launch pad for shared endeavors between the two Gulf neighbors. 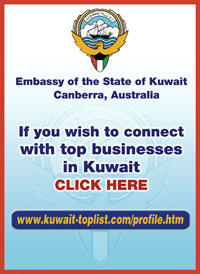 The initiative, undertaken by Kuwait’s acting prime minister and Foreign Minister Sheikh Sabah Al-Khaled Al-Hamad Al-Sabah and his Saudi counterpart Adel Al-Jubeir, reflects the Kuwaiti and Saudi leaders’ collective desire to deepen the intense camaraderie both nations enjoy, read a statement by the Kuwaiti foreign ministry yesterday. Prior to putting their signatures on the dotted line, the Kuwaiti and Saudi foreign ministers held talks focusing on the latest happenings in the region as well as global events. 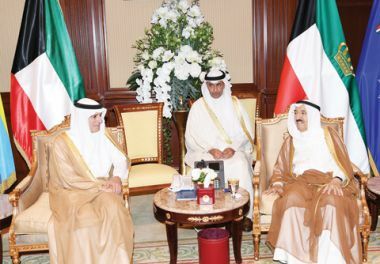 Earlier yesterday, Jubeir met HH the Amir Sheikh Sabah Al-Ahmad Al-Jaber Al-Sabah at Bayan Palace. Deputy Foreign Minister Khaled Al-Jarallah said on Tuesday the coordination council aims at further boosting bilateral relations between Saudi Arabia and Kuwait. Jubeir’s visit also aims at consulting and coordinating over a variety of issues, he added.